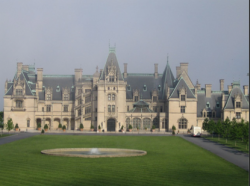 The Biltmore Estate is a French Renaissance-style mansion near Asheville, North Carolina, built by George Washington Vanderbilt II between 1889 and 1895. It is the largest privately-owned in the United States, at 175,000 square feet and featuring 250 rooms. Still owned by one of Vanderbilt's descendants, it stands today as one of the most prominent remaining examples of the Gilded Age. In 2007, it was ranked eighth on the List of America's Favorite Architecture by the American Institute of Architects. Ira Rennert's home, dubbed Fairfield, is located in Sagaponack, NY. Rennert named his home after the adjoining body of water, Fairfield Pond. The house faces the Atlantic Ocean and its grounds measure 63 acres. The buildings, which total over 110,000 square feet, including the 66,000-square-foot main house, have an Italianate facade, 29 bedrooms, and 39 bathrooms. The house has a dozen chimneys and a Mediterranean-style tile roof as well as a 91-foot long formal dining room, a basketball court, a bowling alley, two tennis courts, two squash courts, and a $150,000 hot tub. Its property taxes in 2007 were $397,559.00. 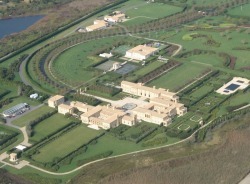 Based on these taxes, the home is currently valued at $170 million making it the most valuable home in the Hamptons. is considered one of the largest occupied residential compounds in America. Oheka Castle, also known as the Otto Kahn Estate, is located on the Gold Coast of Long Island's north shore, at Cold Springs Hills, Suffolk County, NY. It was the country home of financier and philanthropist Otto Khan. Built by Kahn between 1914 and 1919, it was and remains the second largest private home in the United States, comprising 127 rooms and over 109,000 square feet as originally configured. 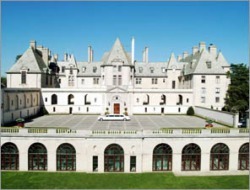 The Oheka name is an acronym of its owner, Otto Hermann Kahn. 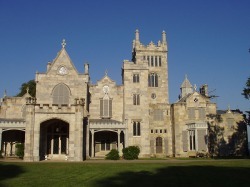 Lyndhurst, also known as Jay Gould estate is a Gothic Revival country house within its own 67-acre (27 ha) park beside the Hudson River, in Tarrytown, NY. The house was designed in 1838 by Alexander Jackon Davis and has been the home of former New York City mayor William Paulding, Jr., merchant George Merritt, and railroad tycoon Jay Gould, whose daughter Anna Gould, Duchess of Talleyrand-Perigord, donated it to the donated it to the National Trust for Historic Preservation in 1961. It is now open to the public. 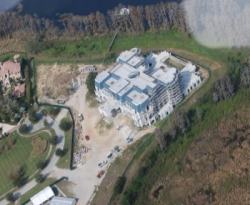 The time share mogul's almost 90,000 square foot mega-mansion, also known as Versailles, is located on Butler Sound on over 10 acres and will house an 8,000 square foot master bedroom. That’s over 3 times the size of an average American home! It will also include a children’s wing, 30 bathrooms, 10 kitchens, a bowling alley, a movie theater inspired by the Paris Opera House, two elevators, underground parking for 40 cars and don’t forget the best part, an indoor roller rink. 475 feet of oceanfront, 18 bedrooms, 20-to-40-foot ceilings, a ballroom, a 4,100 square-foot conservatory with Venetian-style moldings and eight skylights, a media room, an art gallery, a carriage house, and two guest houses.